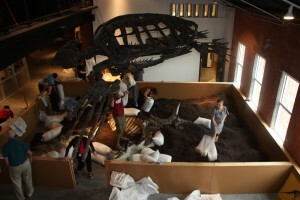 One of the most popular exhibits in the new HMNS in Sugar Land is the dig pit. This kid-friendly activity contains several different dinosaurs, and gives the budding paleontologist the opportunity to see, up close, exactly what the discoverers, excavators and preparators saw when they worked on the original fossils. The dinosaurs in the dig are casts, meaning they are created from silicone and rubber molds made from the actual, real fossil. This process reproduces all of the detail of the original with exacting accuracy. Foremost in size is a cast of “Raymond” the Triceratops. Named for a rancher, this particular Triceratops is a real rarity, being one of only a few articulated examples ever found. Displayed on his right side, his left side was exposed by erosion during the Pleistocene and weathered away. Fortunately he was reburied before the weathering was complete. When you uncover him in the dig he is almost exactly as discovered only a few tail bones and skull bones were repositioned. Another cast fossil is a recreation of the famous “Mongolian Fighting Dinosaurs.” This fossil was discovered and 1971 and features the skeletons of a Velociraptor and a Protoceratops locked in a combat that neither won. 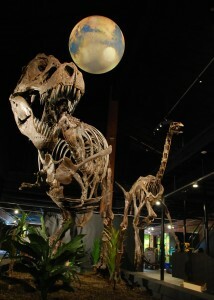 This mount has some restoration, bones were added to fully complete the skeletons, but the positioning dinosaurs are as discovered and amazing. 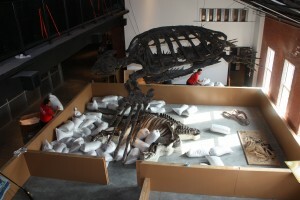 Tucked in a corner of the dig pit is a cast of the most complete skull of Acrocanthosaurus known. Discovered in Oklahoma, this “razor backed” therapod was a fearsome predator in the early Cretaceous of Texas. Tracks attributed to Acrocanthosaurus have been found in the Paluxy River near Glen Rose, Texas in Dinosaur Valley State Park. This cast copy was made after the initial preparation and before the individual skull bones were removed to restore the skull- so you the view is exactly what was seen in the field and after initial cleaning. Lastly, to complete this hands-on collection of Cretaceous dinosaurs there are two panels from the Tyrannosaurus “Stan.” One features his spectacular skull and the other a section of thoracic vertebra and ribs. A fully articulated and mounted copy of “Stan” is on display in the entrance hall. 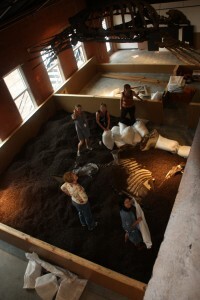 Volunteers and staff fill the dig pit with matrix. The matrix is a recycled rubber product and a popular material for playgrounds. Unlike the ancient sediments covering dinosaur bones in less controlled environments, these can be successfully removed with scoops and a variety of brushes. 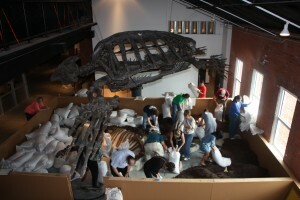 The experience offers budding paleontologists the opportunity to “keep it real” by working on casts of actual dinosaurs without the dilemmas of strained muscles, mashed fingers, cactus, snakes, dangerous storms, scorpions, centipedes, heatstroke, bad food, and looming concerns about a place to go to the bathroom. David is the Museum’s associate curator of paleontology. In addition to running the Museum’s dig program in Seymour, TX and curating exhibits, he’s also unofficial head of The Department of Mysteries, a shadow wing of HMNS that deals with strange goo, unusual fossils, mysterious substances or any other unknown object you'd like to know what to do with. Next Post What can you do with 63 hours?